FORT WORTH - The M&O's last run was about 30 minutes behind schedule Friday night, but no one cared. Actually, the cars carry the name "Tandy Subway," but to many they would always be the M&O, the free short train that carried children and then their children to the sights and smells of Leonards, a downtown shopping wonderland. Members of the Leonard family and a few friends made the last trip into the car barn about 8 p.m. More than 100 people packed the platform for one of the final rides. "I liked it so much. It was fun," said Valerie Heck, a fifth-grader at South Hills Elementary School. She said taking the subway made going to the ice rink extra special. "It's sad. It's the end of an era," said Don Roden, who said he was the first man hired in 1962 to renovate the subway cars. Krysta Brown, 9, a fourth-grader at Mary Louise Phillips Elementary, was surprised to learn that she was taking one of the last rides. She thought there were many more rides to come with her grandmother. "I love this train," Krysta said. The M&O had a 39 1/2-year run. "M&O" were Marvin and Obie Leonard, the brothers behind Leonard Bros. Department Store, who built a 5,000-car parking lot on the banks of the Trinity River. The subway was added to ferry customers from the lot to the store, 3 1/2 uphill blocks away. Today we would say the cars were "pre-owned," but the Leonards bought them "used" from the D.C. Transit Co. of Washington. The cars were remodeled and air conditioning was added. The subway opened at 9 a.m. Feb. 15, 1963. Obie Leonard drove a golden spike into a crosstie. Mayor John Justin hosted a train full of dignitaries on the inaugural ride and they had a cake in the shape of a subway car. The subway cost the Leonards $1 million. Dozens of stores, banks and other businesses took out congratulatory ads in the Fort Worth Star-Telegram, heaping praise on Marvin and Obie Leonard for their vision. A Stripling's Department Store ad reminded readers that it was just across the street from Leonards. Haws & Garrett, the general contractors for the subway, congratulated themselves in a large ad that said, "We did it, and we're glad." Leonards, of course, had a "Subway Opening Sale." Ladies' pajamas were $1. Boys' knit shirts were $1.77. Costume jewelry could be had "five for $1." A few days later, Vaughn Monroe, a big-band singer of the '40s and '50s, made a live TV appearance on the M&O Subway platform. But as suburban malls grew, downtown shopping shrank. Leonards closed in the early '70s, and its building was razed in 1974 to make way for the Tandy Center. But the subway and big parking lot remained. 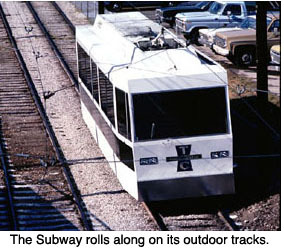 Up to the end, about 3,000 people - from RadioShack, Tarrant County and other downtown offices - rode the subway on workdays. The number jumped to about 4,000 on days when people were summoned to the Tarrant County Justice Center for jury duty. Now the parking lot and the subway are making way for a new RadioShack headquarters. At a ceremonial last ride Thursday evening, Len Roberts, RadioShack's chairman, presented one of the cars to the Leonard family and a second car to North Texas Historic Transportation Inc., a nonprofit corporation that preserves transportation artifacts. Andy Nold, co-founder of the group, said the corporation is negotiating for a display area at LaGrave Field. RadioShack spokeswoman Kay Jackson said negotiations are under way to sell the remaining cars, track and other equipment. She said the company hopes to find jobs for the subway workers. RadioShack plans to break ground on its new headquarters in January or February. The company calls it a "46-acre master planned campus" and hopes to move in in late 2004 or early 2005. The parking lot will be closed to the public on Tuesday, Jackson said.